See also the A to Z listing for a recipe for each letter of the alphabet. Click here. Burger - Pizza - Bread - Hotdog - Spread - pickle - muffins - ALL made with carrots. Here Carrot Top (leaves) recipes here. A carrot cocktail!! 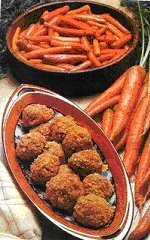 - here - Carrot Balls! - here - Marzipan Carrots (pdf download) Flapjack here Buy Carrot Honey here. People seem to have difficulty microwaving carrots, click here to see how we do it. Are Carrots better cooked or raw - better cooked whole or sliced? Great Chantenay recipes here. Recipes including carrots are of course nothing new and well known and used by the ancients. Some written versions do remain in the archives around the world and some are repeated in the history pages - here. These include: Lombardo Compost, Carrot Puree, pickled carrots, cariota, Jazariyyah (14thC); 16thC here including puddings, carrot salad and carrot sauce. A 10th Century Cookbook - Annals of the Caliphs’ Kitchens - Al Warraq are on a separate page. Carrots are grown all over the world and are readily available in all seasons. They vary in colour from orange, purple, black, pinkish, red, yellow and white. This delicious vegetable is within the reach of rich & poor alike and is rightly called the "universal root". The carrot root is the main edible part and can be eaten raw, drunk as a juice, used in every conceivable salad, cooked as a vegetable, made into jam, marmalade, syrup & sweet dishes. You can also eat the greens tops. Read more here. The Carrot is a very versatile vegetable and can be used in a myriad of savoury and sweet dishes, mostly very healthy eating and good alternatives to stodge. It can be used as a starter, main course, sweet or just as a snack. Carrots may be eaten raw or cooked in almost any manner imaginable. Carrots help to maintain acidic & alkaline properties in the system it is an invigorating & energizing tonic for eyes, skin, bones, heart & muscles of the body. Carrot is blood purifier, diuretic, carminative, digestive, anti flatulent, anti pyretic and vermifuge. Check out the nutrition page for full details. Carrots can be eaten sliced, diced, cut up or shoe stringed. They are sold in bunches, canned, frozen and dehydrated. They may be baked, sautéed, pickled, glazed and served in combination with meats, stews, roasts, soups meat loaf or curries. The mineral contents in carrots lie very close to the skin. Hence they should not be peeled or scraped off. Dried roasted carrot roots can be ground into a powder and used as coffee substitute. Carrot syrup is sometimes employed as a sweetening agent. Alcoholic tincture of carrot seed is incorporated in French liqueurs. Carrot oil is used for flavouring and in perfumery. Considerable honey is manufactured from bees visiting carrot, although the quality is poor. The flower clusters can be french-fried to produce a carrot-flavoured gourmet's delight. The aromatic seed is used as a flavouring in stews etc. Good in savoury or sweet dishes, raw or cooked, carrots are extremely versatile and while they're delicious lightly boiled and served with butter and seasoning, there's no need to stop there! Simply wash in cold water and they are ready to eat or cook with. No need to peel or top and tail. Raw Carrots can be eaten just as they are and are particularly popular with children because of their sweet crunchiness and small size. They can be served halved or whole as crudités with other vegetables and a dip. Juice Naturally sweet Carrots make delicious juice. Bear in mind that to make enough juice for one you'll need around 5 large carrots. Try juicing Carrots with ginger and/or apple or orange to make a delicious and nutritious drink. Steamed Steaming is more gentle than boiling and allows the Carrots to keep their colour, flavour and texture. Place sliced Carrots in a steamer over a pan of simmering water and put the lid on. Steam for five minutes or until the carrots are tender. Try serving with toasted sesame seeds or pine nuts. 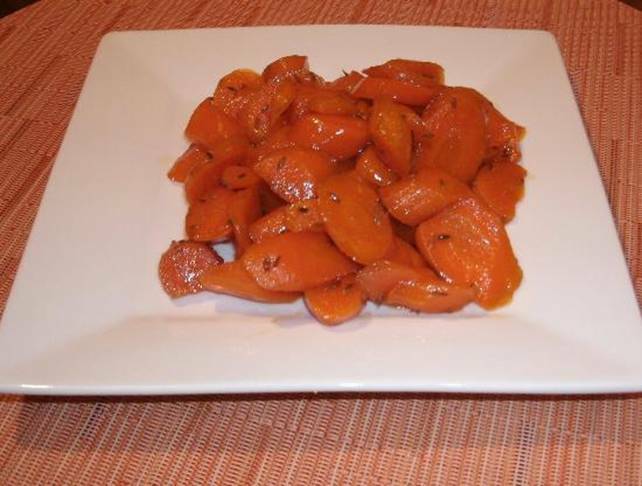 Roasted Toss chunky chopped Carrots in olive oil, sea salt and black pepper and herbs or spices to taste. Try cumin or chopped thyme and experiment to create your own favourites. Arrange the carrots in a single layer in a roasting tin and place in the oven at 190c 375f for 20-30 minutes or until the carrots are tender, slightly browned and caramelised. Baked Wrap 3 inch strips of whole carrots in foil with a couple of tablespoons of wine, a knob of butter, a handful of fresh, chopped herbs and a pinch of salt, leaving them plenty of room to move. Put the parcel on a baking tray and bake for 40 minutes at 220c 425f. Drain the liquid off and sprinkle with chopped parsley to serve. Stir fried Cut Carrots lengthwise into halves or quarters and cut your other vegetables to similar sizes. Try spring onions, peppers and courgettes. Heat a small amount of oil in a wok over a high heat, add the vegetables and cook for a short time, stirring periodically, but not constantly. Add grated ginger, chopped garlic, chopped chillies and coriander to taste. Finish with a splash of soy sauce, a squeeze of lime and a drizzle of sesame oil. In salad Carrots work well in salads either sliced or grated, and can be included either raw, roasted or blanched. Try a fresh dressing of lemon, olive oil and chopped shallots to contrast the sweetness of the Carrots. Chargrilled Slice Carrots lengthwise into 5mm thick slices. Blanch briefly in boiling water (bring to the boil, simmer for a minute or so and plunge into cold water). Drain the carrot slices, toss in a little olive oil and seasoning and place on a hot, ridged griddle pan until they are marked on one side then turn and repeat. The French word Crecy (pronounced kray-cee) indicates that carrots are being used in a dish. A la Crecy refers to a French garnish made of julienned carrots (matchstick shape) or more generally a French method of preparation In which carrots are used. Consomme Crecy is a rich beef broth garnished with julienne carrots. Crecy is a village in France, which once produced carrots famous for their fine quality. Carrottes a la Vichy is a French dish of carrots cooked in Vichy water, from the town of Vichy. Selection of Carrots in the store - Bigger is not better when it comes to carrots so select carrots that are less than 8 inches long and relatively uniform in shape and size. They should be well shaped, firm, and smooth with no cracks. Purchase carrots with a smooth and firm surface. They should not look wilted. If buying carrots with their greenery, make sure the leaves are moist and bright green; the carrots should be bright, firm and smooth. The deeper the colour, the more beta-carotene contained in the carrot. The bright green tops don't guarantee a fresher carrot; however, it is widely assumed that they are fresher than the carrots sold in plastic bags. Remove carrot greenery as soon as possible because it robs the roots of moisture and vitamins. Avoid those which are dry with cracks or any that have begun to soften and wither. The best carrots are young and slender. Carrots should feel heavy, not bend at all and when grated should be quite juicy. The more orange they look, the more beta-carotene they contain. When buying them, look for vibrantly coloured bunches of firm, well-shaped carrots with bright-green tops. If the tops are shrivelled, then you know the carrots are old. Of course, carrots are often sold with the tops removed. To judge the freshness in this case, inspect the stem end for darkening, a sure sign it's been around awhile. Whether loose or in plastic bags, avoid carrots with green shoots sprouting out (not to be confused with their green tops) yellowed tips, soft spots or withering. All are a sign of age. Also avoid carrots with large green areas at or near their tops. This indicates sunburn damage on the vegetable. 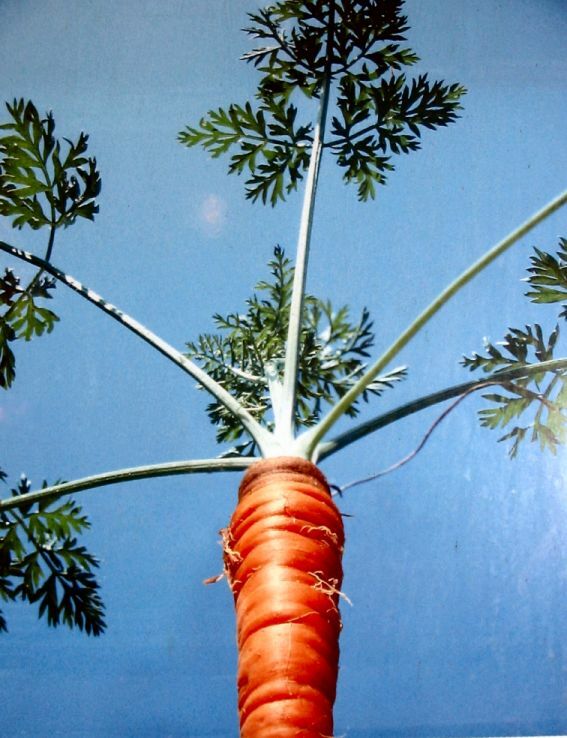 Carrots which an excessive amount of new sprouts or leaves could have large or woody cores. Tiny baby carrots are very tender and sweeter but, because of their lack of maturity, not as flavourful as their full-grown siblings. Store carrots in a plastic bag in the refrigerator's vegetable bin. Avoid storing them near fruit, particularly apples and pears, which emit ethylene gas as they ripen that can give carrots a bitter taste and decrease the storage life of carrots and other vegetables. Also keep away from peaches. A light rinsing is all that's necessary for young carrots and tiny baby carrots; older carrots can be peeled if necessary but remember much of the goodness is in the skin. If carrots have become limp or dehydrated, re-crisp them in a bowl of ice water for about half an hour. Firm up limp carrots by cutting off one of the ends and sticking the carrots in ice water, cut side down. The coarse core of older carrots should be removed. 2 whole wheat pitas, 2 carrots, shredded, 1cup muenster cheese, garlic powder, oregano and black pepper. Preheat toaster oven to 300 F. Distribute carrots evenly on the concave side of whole pita. Distribute cheese on top of carrots. Top with loads of garlic powder, a dash of oregano and pepper. Bake in toaster oven about 15 min. Serve and eat. 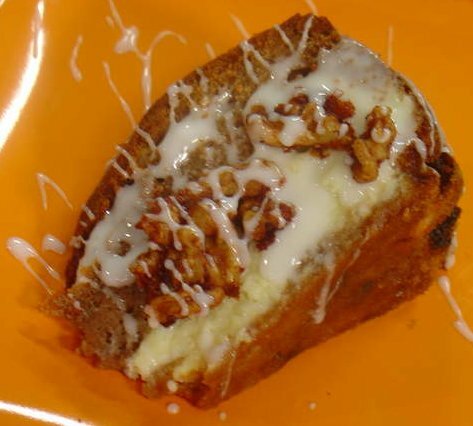 If you love carrot cake, you'll love this recipe! Stir when lukewarm and skin forms on top (110 degrees F). Stir fudge thoroughly but not vigorously either by hand or with an electric mixer. Pause frequently to allow fudge to react. Watch for fudge to thicken, lose its sheen, become light in color or streaked with lighter shades, give off some heat, and suddenly stiffen. If mixing by hand, fudge will "snap" with each stroke; by mixer, mixer waves will become very distinct; by food processor, fudge will flow sluggishly back to center when processor is stopped. If the fudge candies too quickly, just spoon it out and knead it with your hands. Add nuts before fudge totally candies. 2. Whisk eggs with salt, sieve flour mixed with baking powder. It should be ready to fry but if you find it too loose, add a bit more flour. 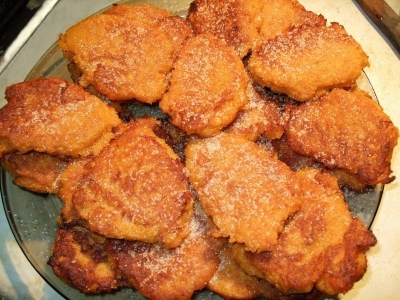 Fry, sprinkle with cinnamon and icing sugar. Sauté carrots, green pepper and onion, until tender. Add tomato sauce, brown sugar, oil and salt and heat to boiling. Boil vigorously for 1 minute. Pour sauce over carrot mixture. Serve hot or cold. Preheat oven to 180 C / Gas 4. Put one rack on the highest level in the oven and another on the bottom. Peel carrots into thin strips using a vegetable peeler; place in a large bowl. Drizzle olive oil over the carrot strips and toss to coat. Season with salt; toss again. Spread carrots on 2 baking trays in a single layer, without overlapping them. Put one baking tray on the top rack and the other on the bottom. Bake carrots in preheated oven for 6 minutes, switch racks, and continue baking until the carrots are crisp, about 6 minutes more. 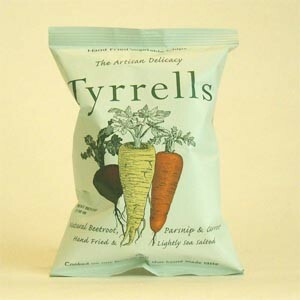 Cool crisps until cool enough to handle before serving. Tart pineapple, fresh coconut, and crunchy walnuts define this carrot cheese cake recipe. Make this cake in a square pan for a crowd, or in a round one for a more elegant presentation. Top with lightly sweetened whipped cream and a sprinkle of cinnamon if you’re pulling out all the stops. Carrot Cheese Cake Recipe, carrots and cheese! What else do you want? Beat cream cheese, sugar and vanilla until smooth. Add flour and eggs, beating continually, until thoroughly combined. Carrot Cake Preheat oven to 350°F (180°C) and butter a baking dish. In a mixing bowl, whisk flour, baking soda, and cinnamon. In another bowl combine oil, sugar, eggs and vanilla extract; beat well. Combine wet ingredients and dry ingredients and add carrots, coconut, pineapple, and walnuts. Stir to blend. Spread carrot cake batter over bottom of prepared baking pan. Drop cream cheese batter over carrot cake batter by spoonfuls. Bake for 1 hour. Cool before frosting. Preheat oven to 325. Grease and flour 10 inch springform pan;set aside. In large bowl combine carrot cake mix, 1 cup water, oil and 3 eggs. Beat with electric mixer on low 30 seconds, scraping sides of bowl constantly. Beat on medium speed for 3 minutes. Fold in raisins. Pour into pan. Bake 1-1/2 to 1-3/4 hours or until center is set. Top will be uneven and center may fall slightly as it cools. Cool in pan on wire rack for 15 minutes. Using small sharp knife, loosen the cake from the sides of the pan. Cool 30 minutes. Remove sides of pan; Cool completely and refrigerate at least 4 hours before serving. Preheat oven to 325. Line small baking pan with foil. Lightly coat foil with cooking spray. In small bowl combine 2 Tablespoons powdered sugar, 1 Tablespoon water and cinnamon. Stir in walnuts. Spread nuts over even layer in prepared baking pan. Bake 8 minutes or until nuts are lightly toasted, stirring once. Cool. In medium bowl combine 1 cup powdered sugar and enough milk to make it drizzling consistency. Cut cheesecake into wedges and place each wedge on serving plate. Drizzle each serving with some of the powdered sugar icing. Break up walnuts and place atop cheesecake wedges. Makes 16 servings. Pre-heat the oven to 180°C (fan)/400°F/gas mark 6. Line a 20x20cm tin with baking paper. Place the butter, sugar and golden syrup into a saucepan. Gently warm over a medium heat to melt. Place the remaining ingredients into a mixing bowl and stir to combine. Pour the melted mixture over the dry and stir well to evenly coat. Tip into the prepared tin and press into the tin using the back of a spoon. This combination may sound a little strange, but Mary says she has always put banana in my carrot cake to give a moist sponge. The banana also makes the texture slightly more dense rather than light and springy. 1 You will need two 20cm (8in) round sandwich tins. Preheat the oven to 180C/160C fan/gas 4, then grease the tins with sunflower oil and line the bases with baking paper. 2 Make the cake. Place the eggs, caster sugar and sunflower oil in a bowl and beat until just combined. Measure the remaining cake ingredients into the same bowl and beat together well. Divide the mixture evenly between the tins and smooth the tops. 3 Bake in the oven for 35-40 minutes until golden, firm in the middle and shrinking away from the sides of the tins. Set aside to cool for 10 minutes, then remove from the tins and leave to cool on a wire rack. 4 Meanwhile, make the icing. Whisk the cream cheese and butter together in a bowl, either by hand or using an electric hand whisk. Add the vanilla extract and icing sugar and whisk again until smooth. 5 Once the sponges are cold, use half the icing to sandwich them together. Sit the cake on a plate and use the remaining icing to cover the top in a pretty swirl (see Tips). Place in the fridge to chill for at least an hour and then cut into wedges to serve. PREPARE AHEAD The cake can be made and iced up to a day ahead. FREEZE The sponges freeze well without the icing. MARY’S FOOLPROOF TIPS Coarsely grate the carrots; if they are finely grated, too much water comes out of them during cooking and results in a wet cake. The icing is fairly soft but will firm up once chilled. 1) Heat the oven to 180C/fan 160C/gas 4. Line a 20cm, 10cm deep cake tin. 3) Beat the eggs with the oil and citrus zests. Stir in the carrots. 4) Fold everything into the flour mixture. Then fold in the walnuts. 6) Bake for 1 hour (30 minutes for buns) or until a skewer comes out clean. 1) Whip the butter with electric beaters or a whisk. 2) Add vanilla, water and lemon juice (if using). 3) Add cream cheese and whip again until smooth. 4) Add half the icing sugar and stir in with spoon. until light and fluffy, the consistency of soft ice cream. 6) Spread or pipe onto cake as desired. 2. Place around eight muffin cases into a muffin tin. 3. Place the butter and sugar into a food processor and blend together. 4. Add the eggs, baking powder and flour, then pulse briefly to combine. 5. Pour the mixture into a large bowl and stir in the carrot. 6. Divide the mixture between the muffin cases. 7. Bake in the oven for 12-14 minutes, or until well risen and golden brown. Place the carrots in a medium-sized saucepan containing 3 or 4 inches of water; steam over medium heat for 15 minutes, till soft. Drain and mash well using a potato masher. In a large skillet, heat the oil over medium heat; add the diced garlic, onions, celery, and peppers; sauté for 7 minutes. Add the tamari, basil, garlic powder, parsley, and oregano; sauté for 2 minutes more, until vegetables are soft. In a large bowl, combine the carrots, sautéed vegetables, tahini and peanut butter. Season to taste. If the batter is too wet, add the wheat germ to make it hold together. Preheat oven to 350. Form the mixture into patties, and place on an oiled cookie sheet. Bake for 10 to 12 minutes, until golden on top. Turn and bake on the other side until golden brown. Make marzipan carrots here - pdf download. 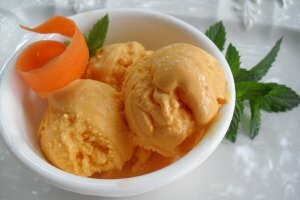 Carrot Ice Cream with Pistachios. Combine the milk and sugar and set to boil in a deep pan. Ladle half a cup of the milk into a cup while not yet warm, and dissolve the flour in it. Add the dissolved flour mixture to the pan. The flour will thicken the milk and is a good substitute for eggs. (Eggs in ice cream raise the problems of salmonella from undercooking and an eggy smell. Furthermore, some people don't eat eggs. So, flour is a great substitute. Cornflour may be used, but I find that regular flour works better.) Stir the milk a few times with a spoon. Chop the pistachios and add to the milk. While chopping, some pieces may crumble to a powder. That is good. The powdered nuts will only make the ice cream thicker. Add the heavy cream and boil some more. Over all, the milk should be boiled for about 35 minutes. Switch off the flame. Allow milk mixture to cool. Add cold carrot juice and place the entire mixture in the refrigerator to cool. After it is cooled, pour into the ice cream container and make ice cream as per instructions of your ice cream machine. When ice cream is ready, spoon into a plastic tub and place in freezer for about 15 minutes to firm up some more. Serve scoops in bowls, garnished with additional pistachios if you wish. Optional ingredients: The ice cream can be made more interesting by adding half a tea spoon of saffron strands to the milk mixture at the same time that you add the chopped pistachios. Also, by adding powdered cardomom powder to the milk at the beginning of the recipe. Golden raisins are also optional--may be added into the ice cream machine, or boiled in the milk, depending on your preference. Now that summer is around the corner, this is a great time to try out this recipe. The carrot juice and milk are very healthy--for children and seniors in particular. 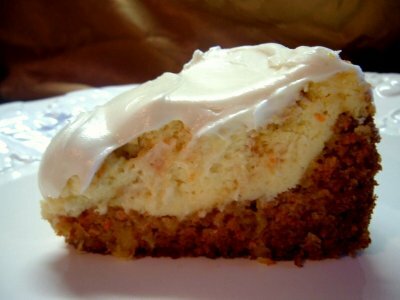 Carrots are indeed a dessert food, as fans of carrot cake know well. The creamy orange colour of this dessert is most attractive. Makes 2 servings, Food processor required. Method: Grate the carrots. In the large bowl of a food processor, process the grated carrots and frozen bananas until well combined. Add the coconut milk and any optional ingredients to the food processor and process until the mixture is thick and reasonably smooth. Spoon into two bowls or serving glasses. Sprinkle with desiccated coconut/maple syrup etc before serving if desired. Mix all ingredients together, then add the carrot mixture. Process in ice cream maker according to manufacturer's instructions. Freeze for 6 or more hours until solid. Serve with pistachios on top. In small saucepan, boil carrot slices in water until very tender. Drain, then make puree and reserve. In saucepan over medium heat, whisk together half-and-half, cream, vanilla, orange rind and cinnamon stick, stirring to make sure mixture doesn't burn or stick to bottom of pan. When cream mixture reaches a fast simmer (do not let it boil), turn off heat and let flavours infuse 10 minutes. Whisk egg yolks and sugar together. In thin stream, whisk half of cream mixture into egg yolk mixture. Then pour egg-cream mixture back into saucepan containing rest of cream mixture. Heat over medium heat, stirring constantly with wooden spoon. At 160 degrees, the mixture will give off a puff of steam. When mixture reaches 180 degrees it will be thickened and creamy, like eggnog. If you do not have a thermometer, test it by dipping a wooden spoon into the mixture. Run your finger down the back of the spoon. If the stripe remains clear, the mixture is ready; if the edges blur, the mixture is not quite thick enough. When it is ready, quickly remove from heat. Meanwhile, in a bowl put 2 handfuls of ice cubes in bottom, and add cold water to cover. Rest a smaller bowl in the ice water. Combine the carrot puree with the custard, mixing well. Pour the cream mixture through a fine sieve (to remove vanilla bean pieces, orange rind and cinnamon sticks) into smaller bowl. Chill 3 hours, then continue according to ice-cream maker directions. Mix the sugar and water in a pan, bring to the boil to make a sugar syrup and take off the heat. Place the gelatine leaves in water to soften and then squeeze off the excess liquid. Add the softened gelatine into the syrup and then add the rest of the ingredients. Churn and freeze until set. Serve between courses as a palate cleanser or as a light dessert. 1. Wash, peel and chop ends off of carrots (save the ends for stock). 2. Shred the carrots using a grater. You can use a food processor or a chopper, using a grater would allow greater control over the size consistency of the carrots and not turn them into juice. 3. Spread carrots out and in a single layer onto your dehydrator tray. If you have a circular dehydrator, you’ll need to use the liner so that the carrots don’t fall through the holes. 4. Set the temperature to 135 degrees and walk away. 5. Allow the carrots to dry for 8-12 hours, depending on your machine and climate. Check the carrots every couple hours or so, starting at the sixth hour, to rearrange and check for doneness. Carrots are done when they are crispy and no liquid remains in the pieces. 6. Store in an airtight jar. You can dehydrate carrots without a dehydrator, but it requires a bit more effort. Set your oven to it’s lowest temperature possible – ideally 170 degrees. Spread your carrots out evenly on a baking sheet and “cook” in the oven with the door propped open. Check the carrots after two hours, and every hour after that. You may even want to check every 30 minutes. With the oven temperature being high (compared to the temperature of a dehydrator), your carrots can go from not done to done in a flash. Add to soups, stocks, breads, muffins, cookies, or rice pilaf as is. Grind into powder to thicken soups and sauces. Rehydrate for stir-frys, salads and side dishes. Blanching – plunging carrots into boiling water for 2-5 minutes until slightly tender, then removing to ice cold water to stop the cooking time. Steaming – using a vegetable steamer, steam carrots for 2-5 minutes until slightly tender. Lemon Juice – spray and coat carrots with lemon juice before setting them on the tray You can do absolutely nothing to the carrots and the end result will be more or less the same. Some dehydrating sites say you do not have to blanch carrots before drying. It is recommended that you do blanch carrots before dehydrating. Why? Because you get better results. Blanching stops enzyme action that causes loss of colour, texture and flavour. In dehydrating it also shortens the drying and re-hydration time, keeps dried veggies fresh for longer, and kills micro-organisms that could induce spoilage. Pre-treating vegetables by blanching in boiling water or citric acid solution is recommended to enhance the quality and safety of the dried vegetables. Blanching helps slow or stop the enzyme activity that can cause undesirable changes in flavour and texture during storage. Blanching also relaxes tissues so pieces dry faster, helps protect the vitamins and colour and reduces the time needed to refresh vegetables before cooking. In addition, research studies have shown that pre-treating vegetables by blanching in water or citric acid solution enhances the destruction of potentially harmful bacteria during drying, including Escherichia coli O157:H7, Salmonella species and Listeria monocytogenes. Cream together sugar and shortening. Sift together dry ingredients in a separate bowl. Add dry ingredients to creamed mixture. Add eggs, one at a time. Add grated carrots and raisins. Pour into greased and floured loaf pan (9 1/4 x 5 1/4 x 2 3/4). Bake for 55 minutes at 375F. Preheat oven to 350º. Cook carrot in boiling water for 15 minutes or until tender; drain. Place carrot in food processor and process until smooth. Lightly spoon flour into dry measuring cups. Combine whole-wheat flour, cinnamon, salt, baking soda, baking powder, ginger and cloves in a large bowl. Combine carrot, sugar, oil, yogurt, egg and egg white in a small bowl, stirring with a whisk. Add carrot mixture to flour mixture, stirring just until combined. Pour batter into an 8” loaf pan coated with cooking spray. Bake at 350º for 50 minutes or until a wooden pick inserted in center comes out clean. Cool bread in pan for 10 minutes on a wire rack; remove from pan. Cool completely on a wire rack. 1(8 ounce) package cream cheese, softened ; 4 small carrots, grated; 1 cup ground pecans; 1 tablespoon finely chopped onion ; 1/4 cup mayonnaise; salt and pepper to taste. In a medium bowl, thoroughly blend cream cheese, carrots, pecans, onion, and mayonnaise. Season with salt and pepper. Cover, and refrigerate until serving. Serves 16, on a piece of bread or cracker. 1. Heat oven to 350°F. Spray 15x10x1-inch pan with cooking spray. Place carrots, sweet potato and onion in pan. Drizzle with oil. Sprinkle with thyme, garlic, salt and pepper. Stir to coat. 2. Roast uncovered 35 to 45 minutes, stirring occasionally, until vegetables are tender. 3. In food processor, place vegetable mixture. Cover; process until blended. Spoon into serving bowl. Serve warm, or cover and refrigerate until serving. Carrot chips are a new and improved version of potato chips. The concept is the same: the root vegetable is washed, sliced, and fried or baked until it is crisp. It can be salted or seasoned much like a potato chip can. Carrot chips, in fact, look much like deep orange potato chips. Unlike potato chips, however, carrot chips are rich in Vitamin A, an essential part of a healthy diet. Fried carrot chips, like potato chips, can contain a large amount of fat. However, there are many health-food companies that offer baked carrot chips that contain all of the great vitamins, but a nominal amount of fat. With health consciousness on the rise, people are always looking for better ways to eat. Snacking, it has been found, is a big reason why people gain weight; weight gain, of course, can lead to all kinds of circulatory and skeletal problems and can result in obesity and diabetes. Furthermore, many snack foods such as potato chips are full of fat and calories, but offer little nutrition. Therefore, choosing healthy snack foods like baked carrot chips can be very important to one’s health. 1. Spray a baking sheet with a light coat of oil. 2. Slice your desired number of carrots into rounds that are 1/4 inch (2.54 cm) thick. 3. Place the slices on the baking sheet without overlapping them. 5. Place the baking sheet in an oven, preheated in 350 degrees Fahrenheit (177 degrees Celsius). 6. 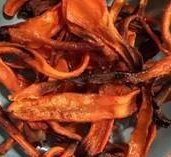 Bake the carrot chips for approximately five minutes, or until the edges turn brown. 7. Turn the chips and back for another 5-10 minutes. Carrot chips may, in fact, become a very important food in some developing countries University of Nebraska Scientists Ahmad Sulaeman and Judy Driskell have been working with carrot chip recipes. They believe that carrot chips might help to combat vitamin deficiencies in children who are growing up in impoverished circumstances. These scientists are working with deep fried carrot chips. Because people in developing countries have a hard time getting enough calories as well as vitamins, the fat content in deep friend carrot chips is not a concern. In fact, the extra calories can be quite important to their diet. Unlike baked carrot chips, deep fried carrot chips can contain over 50% fat. Bring water to a boil and add barley. Partially cover and simmer until water is absorbed. Add 1 cup of milk and simmer until absorbed. If the barley is not done add more milk - done but firm with some milk left , cool a little. Preheat oven to 400 degrees. Mix carrots, salt, honey and nutmeg into milk and barley then add eggs. Butter a 1 1/2 quart casserole with half the butter and sprinkle in part of the bread crumbs and then pour in the mixture, topping with the rest of the bread crumbs and dot with the butter. Bake 40 minutes or until top and sides are brown. Bring 1/2 cup water to a boil in a saucepan. Add honey, salt, and then stir. Add carrots. Cook on medium heat for several minutes, stirring occasionally, until the liquid has mostly evaporated and the carrots are tender. Turn off heat. Add cumin, olive oil, and lemon juice and stir. About 4 servings. Ingredients: 3/4 cup brown or white sugar; 1/2 cup water; 2 tbsp. walnut oil; 1 tsp. ground ginger; 2 lbs. medium size carrots, grated. Directions: Combine sugar, water, oil and ginger in a large pot; heat slowly, stirring constantly to boiling. Stir in carrots, cover and simmer for 30 minutes. Uncover and continue cooking, stirring several times, about 10 minutes longer or until mixture is thick and richly glazed. Pour into oiled pan, cool slightly, cut into squares or diamond shapes. •2 lbs large carrots, peeled and sliced into 1/4 inch thick pieces; 5 cloves garlic peeled and diced ;1 1/2 cups vinegar;1 1/2 cups water;10 bay leaves, whole ;8 peppercorns ;1 teaspoon salt; 6 oz. pickled jalapenos. Preparation: Heat oil in a large saucepan and sauté the garlic. Add in carrots and sauté for 2-3 minutes. Carefully add in vinegar, peppercorns, salt, and bay leaves. Bring to a simmer for 5 minutes and then add water and jalapenos and bring to a simmer again for another 10 minutes. Let it cool completely and then transfer the carrots and cooking liquid into a covered container and refrigerate overnight. Store the carrots in the liquid and use a slotted spoon to serve them. You may leave the bay leaves in the liquid to add to the flavour, but do not eat them. Always remove the bay leaves before you eat the carrots. Combine everything in a bowl. Should be a very liquid, sweet dough. If it doesn’t look liquid, add a splash of milk, or more oil. Grease or line the muffin cups. Bake for 20-25 minutes at 350 degrees or until you can stick a fork in and it comes out clean. Cool until completely cool, and ease out gently with a knife. EAT! Have you had your carrots today? Maybe you don't realise there are 10 very good reasons why you should be eating this wonderful vegetable every day. 1. They taste good. 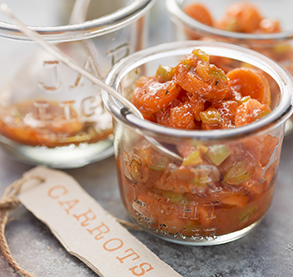 Carrots have a mild, pleasant flavour that is great by themselves or blended with other foods. 2. Carrots can be eaten cooked or raw. Crunchy or soft, from soups to salad, it's entirely up to your mood or your menu. 3. Kids (even toddlers) like the mild taste of carrots. 4. Raw carrots are great to carry in a sack lunch, to your next picnic, or in the car when you are on the go. 5. Carrots are available and in season all year long. 6. Carrots are inexpensive all year. 7. They are a great source of Vitamin A and Beta Carotene. Vitamin A is very important for healthy skin, eyes, hair , growth, and helps our bodies resist infections. Beta Carotene is linked to reducing chronic diseases such as cancer and heart disease. (see nutrition page). 8. Carrots are a good source of fibre. Fibre is important of our gastrointestinal tracts and is linked to reducing cholesterol in our bodies. 9. Carrots are low in calories. One average carrot contains about 30 calories. 10. Carrots are a great source of alpha carotene, probably more powerful than beta carotene in inhibiting processes that may lead to tumour growth. The basic rule of this diet is to add a carrot at or near the beginning of every meal. Why should this work? This works because a bulky carrot at or near the meal's beginning leaves no room in the stomach at the meal's end for the extra ice-cream or cheesecake. That saves perhaps 500 calories a day, which translates to a weight loss of about a pound a week. Even plain water at the beginning of a meal will tend to create a full feeling in the stomach sooner in the meal. This will reduce the amount of food consumed at the end. But eating carrot is more fun. Getting your carrot-a-day is easy, considering the vegetable's versatility and blendability. And subtlety: carrots enhance but don't overwhelm. Here are ways to put power on your table. Cook grated carrots with beans, split peas, lentils, rice, pastas. Good in stuffing. Try them roasted - split large carrots lengthways and brush with a little oil then put on a roasting tray in a 200c oven for about 45 minutes until tender and browned. Try roast carrots, potato, sweet potato and pumpkin serve with steamed green vegetables and a nice sauce. Add to sauces, white or red. Grated carrots give body and impart subtle flavour, and they fit any tomato or creamy soup, sauce, or casserole. Hot and Cold Salad: Sautè onion, green pepper, and grated or finely sliced carrots. Remove from heat and pour your preferred salad vinegar over hot veggies. (It will hiss and steam.) While hot, add to chilled salad greens. Toss and serve. Herb and Vegetable Bread or Biscuits: To your regular dough, add finely grated carrots; minced onion (dried flakes or fresh green); parsley; garlic powder; sprinkle of basil and skosh of oregano or sage. We like to add some dried or pesto tomatoes and a few hearty shakes of parmesan cheese. For some reason, males and small children who normally turn down veggies like those baby carrots. They come washed, peeled, prepackaged - meaning they cost more than their bulk-buy counterparts. But it's still more nutrition per penny than fast food. Lose weight - no problem! -Click here! The cookware we use for food preparation, the water we drink, the air we breathe, and the pesticide-sprayed leafy greens we eat, can lead to an exposure to heavy metals. According to the American Journal of Clinical Nutrition, October 1985, carrot juice can pull these heavy metals from fatty tissue where they reside, bind them up, and discharge them from the system. Carrot juice, because of its many healthy benefits, is frequently called the "miracle juice." A large number of people in all walks of life suffering from various ailments have found that the inclusion of carrot juice in their diet has greatly improved their health. Countless others have found it to be a valuable "protective" agent in the building and maintenance of health in both children and adults, while its delicious flavour makes it popular with all members of the family as a beverage, plain or combined with other juices. Carrot juice is a very important source of vitamin A. Scientists in the U.S. estimate that this juice contains the largest source of vitamin A, than any other fruit juice. Carrot juice provides an important source of dietary fibre and has approximately 24 calories in each 2 oz. Serving. It contains important nutrients such as calcium, phosphorous, iron, sodium, potassium, vitamin B complex, vitamin A, and as mentioned - mostly vitamin A. Fresh juice has the ability to distribute an additional significant variety of nutrients, recognized as enzymes, which are your body's labour power. Performing as catalysts in hundreds of thousands of chemical reactions that occur throughout your body, enzymes are crucial for digestion and amalgamation of food, for conversion of food packs into body tissue, and for the creation of energy at the cellular level. In fact, enzymes are vital for most of the metabolic actions taking position in your body every second of every day. Fresh juices are a wonderful resource of enzymes. The freshness of juice is one of their key features, since enzymes are damaged by high temperature. Given that fruits and vegetables are juiced uncooked, the enzymes are still there when you drink the juice! Fruit and vegetable juices are also excellent sources of the traditional nutrients. Citrus fruits (grapefruit, oranges, etc.) are packed with vitamin C. Carrot juice contains vitamin A, in the form of beta-carotene. Green juices are excellent sources of vitamin E. Fruit juices are also a source of essential minerals like iron, copper, potassium, sodium, iodine, and magnesium, which are most easily assimilated throughout digestion. Since juicing eliminates the hard to digest fibre, nutrients are obtainable to the body in a great deal of larger quantities than if the piece of fruit or vegetable was eaten whole. For instance, since a lot of the nutrients are in the fibre, when you eat a raw carrot, you are only able to absorb about 1% of the beta-carotene. When a carrot is juiced, eliminating the fibre, virtually 100% of the beta-carotene may be assimilated. Fruits and vegetables offer another substance that is completely fundamental for good health - water. Over 65% of most of the cells in the human body are made of water, and in some tissues, such as the brain, the cells may be made up of as much as 80% water. Water is extremely necessary for good health, yet most people don't consume enough water each day. Fruit and vegetable juices are free of unnecessary substances and are bursting with pure, clean water. Almost any large variety, one called Neptun is an excellent long season 'Flakee' type carrot with large conical roots up to 12in/30cm long, with an intense orange colour and are particularly sweet for their type. If you can find it, Juwarot is the carrot with the highest beta carotene content. Otherwise the regular shop varieties, Imperator, Nantes, Chantenay, Danvers and Nairobi. Avoid "baby carrots", also make sure you use all of the carrot. Many take off their skins, where most of the goodness lies. Make sure you drink it as soon as possible as it does not keep well. Best made and drunk fresh. 1. Wash fresh, whole carrots. Trim off the ends. 2. Following instructions for your model, push carrots through juicer, catching juice in cup as directed. 3. Clean pulp from strainer as you go along, if necessary. Preparing Carrots for Juicing. Wash carrots thoroughly in cold water, using a stiff vegetable brush. Scrape lightly, but do not peel, as valuable vitamins and minerals lies close to the surface. The juice should be taken immediately it is made, if at all possible. If not, let the juice flow directly into glass jars which should then be covered with screw-on lids. After pouring the quantity to be used immediately, keep the remaining juice tightly covered, in the refrigerator to prevent loss of vitamin and mineral content through oxidation. Carrot juice blends with practically all other juices. It is a delicious nourishing beverage for all members of the family at all times and it should be an important part of the diet in cases of illness. One pound of carrots will make approximately six to eight ounces of carrot juice. The large, firm, dark-yellow carrots should be selected for juicing, rather than the light-yellow ones, because of their greater carotene content. It’s also important to add a good squeeze of lemon juice, you won’t really notice the taste of it and it will stop the apple juice from oxidising and turning the whole thing a muddy brown colour. Oxidisation won’t affect the taste, but it’s nicer if your fresh juice doesn’t look like pond water. Black Carrot has been planted in Turkey for over a century and is juiced for fresh drinking and manufacturing a local sharp summer drink called "Salgam". Tameks Tarim is the Turkish producer and their site is www.tameks.com. It is not necessary to peel the carrots, but if they are not organic, you may wish to. Try running an inch or so of ginger root through the juicer with the carrots for a zesty variation. 2. It may pick up flavours in the freezer, so be certain to wrap it very tightly. 3. A small amount of nutritional value will be lost. 4. There is no need to blanche the carrots first, just make juice as normal in a juicer. 5. It should last a month, but it's never as good as fresh. Combine carrots, breadcrumbs, cheese, salt, pepper, and hot sauce; toss lightly. Beat egg white until stiff peaks form; fold into carrot mixture. Shape mixture into 2-inch balls; roll in cornflakes. Place balls on a lightly greased baking sheet. Bake at 375 for 30 minutes. Now try Jamaican Carrot Juice - with a kick! This carrot juice drink, made mostly on Sundays, is the crowned king of Jamaican dinner juices. This is one of the methods used to make this juice. Wash the carrots to remove any dirt or foreign matter, then cut the carrots into tiny pieces, let us say 1/8 inch (please, do not measure the pieces just estimate). Put carrots into the Electric Blender one handful at a time until the Blender is ¾ ways full, each time. Add about ½ cup of water to the carrots in the Blender. Turn the Blender switch to puree and allow carrots to process until they are ground to a pulp. Remove pulp and place into a large mixing bowl. Add 1 cup water to pulp. Using your clean hand, squeeze the pulp in your palm, allowing the juice to flow through the strainer. Put the squeezed pulp on a plate to the side. Repeat this process until all the pulp is squeezed. Add water to the squeezed pulp that you put on a plate earlier, in a mixing bowl. Squeeze this pulp again. Drain carrot juice into another container through the strainer so as to stop any remaining pulp from getting into the final product. Mix in the condensed milk with the carrot juice, add sugar to taste. Add nutmeg and vanilla flavouring. You can add more water or more ingredients if you like, to bring about the taste you desire. Add a capful of white rum to the mixture to enhance the flavour! I guess most people think of carrot juice as a health-food store item for "cranks". In fact it has been available on supermarket shelves for years. You will find cans of carrot juice where other canned fruit and vegetable juices are. And although a freshly "squeezed" glass of carrot juice made in a juicer may seem like it's better for you, the canned juice has no preservatives, no added ingredients, and every bit as much beta-carotene as the fresh stuff. Don't even think about making soup with water when you can use carrot juice instead. Savoury soups and stews, minestrone, chilli, tomato, cream of carrot (naturally), winter squash, split pea, you name it--benefit from the added richness. And if you're a fan of fruit soups, you can sneak some carrot juice in there, too. Another place this "liquid gold" fits in: sauces. Carrot juice can be incorporated into pasta (tomato) sauce, meat or poultry gravies, and savoury cream sauces, and to thin vegetable purees to pouring consistency. 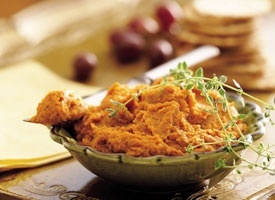 Add carrot juice to mashed white potatoes or sweet potatoes. The mash will look like it's dripping with butter whether you add any or not. And that goes for other mashable vegetables like turnips, parsnips or celery root. If you're baking a cake, try subbing carrot juice for half the milk in the recipe to enrich the golden-ness of a gold cake or a fruit or nut cake. Carrot juice makes a wonderful addition to chocolate cakes and brownies, too. In Broiled Carrot-Glazed Chicken, brushed a sweet-tart glaze (made of carrot juice, honey, and vinegar) over chicken breasts and then broil them. Some of the same mixture is used as a sauce. You could use carrot juice as the foundation for other glazes too: for chicken, meat, or fish. If you go to the trouble of making pasta from scratch, you might as well use carrot juice instead water and enjoy some jazzy orange pasta. The flavour will be subtle, so don't worry about coming up with a "taste-matching" sauce. But the colour suggests some complementary ingredients: slivers of smoked salmon, winter-squash puree, a curried-chicken topping, for instance. Visit the Vitamin A page. Click here. 1. Feed your carrot pulp to rabbits, dogs, cats, and horses, among other members of the animal kingdom. Soak rolled oats in the water (do not make them soggy) and add to them carrot and apple pulp. Then add chopped almonds, sunflower seeds, sesame seeds, poppy seeds, linen seeds, and sultanas . Add honey to taste. Mix thoroughly together and then put and flatten into a baking tray. Bake at 180-190 C until nice and dry. 3. Make Golden Macaroons - I'm sure there can be lots of variations with this recipe so I hope everyone enjoys it. Blend dry, quick or rolled oats to make a flour. Mix well all ingredients. Let sit 10 min. firmly pack dough into a tablespoon then drop on an oiled baking sheet. Bake at 325f for 30 min. 4. Mix carrot pulp in with spaghetti sauce along with the fresh onions and garlic. 5. Save the pulp and make delicious muffins with whole wheat flour and honey. 6. Carrot cake and patties. Patties can be made of half cooked brown rice, half carrot pulp, and chopped onions, garlic, and green peppers. Use an egg to bind it together, but I'm sure flour would work just as well. 7. You can also add to the apple and carrot pulp some grated horseradish for a good winter salad. If you use celeriac bulb for juicing, then that pulp is excellent with crushed garlic and makes a healthy type of mayonnaise to spread on toast. 8. Freeze the pulp in freezer bags pressing them flat so they are easy to break off a piece. This is good to drop into soups, sauces, mixes of various sorts. It works in anything. 9. Gather pulp in the refrigerator until there is plenty then dry it out. You have dried carrot pulp flakes. This keeps indefinitely. Sprinkle it on or in just about anything including on top of salad as "sprinkles." 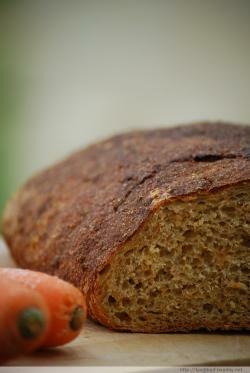 It also works well in whole grain quick breads such as muffins, pancakes, etc. Depending on what you plan to put it in, if you need moisture added, use the moist pulp either fresh or frozen. If you want it dry, as on salad, use the dehydrated. 10. If all else fails use in the compost bin. It adds moisture to the dry layer above and below it and cuts composting time significantly. Have you heard of the Baptist pastor who at the age of 42 was pastoring a large church in Glenfalls New York and was stricken with colon cancer? He heard about a different way to eat so he started on raw vegetables, fruit, barley green, distilled water and for the first couple of months 8 to 10 glasses of pure carrot juice a day. Not only did his cancer disappear but every other ailment as well. That was about 18 years ago and now Dr George Malkmus gives seminars across the US and Canada and recently in Australia. He says "Eat the Hallelujah Diet and you do not have illness". Quite a claim! Check out the website of Hallelujah Acres for yourself. Forget the religious hype and see the diet then read the testimonies from people of all ages who have had their serious cancers, diabetes, arthritis, high blood pressure, heart disease and other serious illnesses disappear as a result of the diet. In Polish tradition Christmas Eve is celebrated with a thirteen course dinner. One condition covers this event - there must be no meat dish. This inevitably involves the introduction of at least one carrot dish. If you want to go the whole way with the thirteen course Christmas Eve Dinner then tradition dictates three different soups; three fish entrees; and there must be an odd number of appetizers, garnishes, accompaniments, and desserts to complete the meal. Christmas Eve Barszcz (beetroot soup), Christmas Almond Soup, Beer Soup with Eggs; Smoked Salmon Omelettes, Poached Pike, Carp with Horseradish Sauce; Baby Carrots Polonaise, Hot Polish Chicory, Mushroom Stuffed Tomatoes; Christmas Eve Bread, Poppyseed Roll, and Fruit Compote. However she generously admits that, "even the most diligent chef finds it difficult to incorporate all the above dishes in one meal"! and pour over a good stock, say about two quarts. Boil it, then pass it through a sieve; it should be of the thickness of cream, return it to the saucepan, boil it up and squeeze in a little lemon juice, or add a little vinegar. How to successfully microwave carrots. Here is how we do it. Take a suitable dish which has a removable cover, we use a pirex dish and lid (which is microwave, heat proof glassware). Take about a pound of carrots (half kilo) and put them in the dish. These can be whole carrots or sliced it makes no difference. Boil some water in a kettle and pour the boiling water over the carrots to cover them, then immediately pour off the water leaving the carrots still wet and the merest hint of water in the bottom of the dish. Put the lid on then Microwave at full power for about 5 minutes. This works every time. Back to start. Do your Carrots Turn green in your cakes?? Have you heard of the situation where carrot shreds in carrot cake turn bright green after baking. Some cooks think this is crazy. Do you know what circumstances produce the colour change? Is it the sequence ingredients are added, the type of oven (gas vs. electric) used? People seem to either be familiar with the colour change or deny that it happens. Any ideas? Answers so far - it could be a reaction to the baking soda. You may try this experiment next time: Bring a pot of water to a boil. Put your shredded carrots in a fine mesh colander, and dip it in the boiling water for 5-10 seconds, and then straight in to ice water (to stop the cooking process). Now they are blanched, and are less sensitive to chemical reactions. OR Sometimes cakes will turn greenish if left to cool in a metal pan. This is due to the oxidisation of the metal, and can be prevented by turning the cake out onto a cooling rack after about 10 minutes. We have heard of carrots turning green when bought in packages pre-grated. This could also be due to oxidization. You might try peeling your carrots first, before grating them. OR The colour change in your carrots is probably because they have been mixed or baked in a metal pan. Some aluminium and stainless steel dishes can cause the carrots to oxidise and turn green. Use a glass bowl to mix, and line metal baking pans with parchment. OR It is simply oxidisation. Sometimes it may also cause a reaction when mixed in an aluminium or stainless steel bowl or even when baked in an aluminium pan. If that's the case, you could just mix it in a glass bowl and line your pan with parchment. It may be even a reaction from the baking soda/powder. Carrots naturally turn green if even left out, especially uncooked shreds. OR Make sure to peel all of your carrots before shredding them and you won't have bits of green in your cake! Baking soda can have an effect on the colour of fruits. Baking soda is chemically classified as a base - above 7 pH- in order to work, baking soda must be combined with an acid-below 7 pH- (high school chemistry). Too much baking soda made blueberries turn greyish-green. If you replace the baking soda with cream of tartar (an acid), the cream of tartar makes the blueberries turn more of a magenta colour. So maybe the same with carrots? For a more in depth scientific discussion on the problem click here. • 7 ounces (1 roll) marzipan, Red and yellow food colouring, Powdered sugar for dusting, Edible sprigs of herbs for decoration (optional). 2. Knead the marzipan until it has softened slightly. Flatten the marzipan into a disc, and add a few drops of red and yellow food colouring to the middle, using a ratio of 1 drop red to 2 drops yellow. Fold the marzipan into a ball and begin to knead the colour throughout the dough, adding more food colouring if desired, working until the marzipan is one uniform colour. This gadget may look weird, and perhaps you can say that it is. The Carrot Curler makes a difficult job, that of making carrot ribbons for garnish, into something easy. 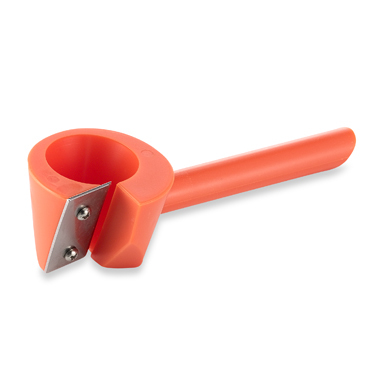 Whereas the traditional vegetable peeler is designed for many purposes, the carrot curler has one unique function. Simply place the carrot in the curler and rotate the carrot clockwise. The ribbons will just shave right off. available from Bed Bath & Beyond (USA). Hard Water - Whilst in the kitchen - carrots can come to the rescue of a scaled kettle - Toss the carrot peels into your kettle with enough water to cover them. Bring to a boil and drain. Place the peels in the trash and reboil a fresh pot of water one more time to remove remaining scale and carrot juice. Also you can water your plants with the carrot water. 1. Scrape off excess carrot. 2. Flush under cold running water to loosen the stain. 4. Launder, using the hottest water and the type of bleach that are safe for the fabric. 2. Mix one tablespoon of liquid hand dishwashing detergent with two cups of warm water.